Nothing in the universe stands still. Any body, whether it's a planet, a star, a galaxy or just a piece of a meteorite, moves relative to other bodies. 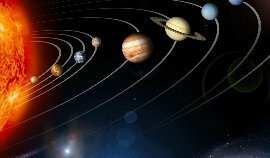 The observer, being on the Earth, can observe from time to time how the planets of the solar system moving in their orbits come close to each other and such a phenomenon in astronomy is called a conjunction. This, of course, does not mean that the planets and in space are converging with each other, they are just visible in one direction from the Earth and this convergence is seeming. In relation to Earth, the outer (or upper) planets are located farther from the Sun than the Earth (Mars, Jupiter, Saturn, Uranus, Neptune) and the lower planets (Mercury and Venus). In this case, for example, for Mercury all planets will be external, for Neptune - all planets are internal. Earth is an outer planet from the point of view of Venus and the inner planet from the point of view of Mars. Connections can also occur between planets or between the Moon and one or more planets, but in this case the term is often used more freely, with an accuracy of a few degrees. The upper connection is the point of the orbit of Mercury or Venus, when the planet, when viewed from the Earth, lies behind the Sun. The lower connection is the position of the planets of Mercury or Venus, when they are directly between the Earth and the Sun. Because of the relative slope of the planetary orbits, the actual passage of Mercury or Venus over the disk of the Sun is quite rare. Usually during the lower connections of the planet pass in the sky to the north or south of the Sun. The period when the outer planet is closest to the Earth is called a confrontation. The time interval between two oppositions of the same planet is more than a year (the period during which the Earth must make one revolution, after which it "catch up" with the planet, which also did not stand still). The opposition of Mars occurs every 26 months (ie less than once in 2 years), and the confrontation of Neptune - once in 367 days. If the orbits of all the planets were exactly circular, during the confrontations the distance between the planets during the oppositions would always be the same. However, all the bodies of the solar system (including the Earth) move around the sun along elliptical orbits, then approaching it, then retiring. The nearest point to the Sun of the orbit of the celestial body is called the perihelion, and the most distant point is the aphelion. The apparent dimensions of Mars are maximal during the great oppositions, when the Earth is in aphelion, and Mars is near the perihelion of its orbit. City New York.